Arden Photography took a trip to the Grand Bohemian Hotel, and it almost was as if I had stepped into a Disney princess tale. Red roses and purple irises and orchids decorated the bouquet of the bride as well as the altar backdrop and reception area. Ruby red Jimmy Choo’s were donned by the glowing bride in her lace ballgown with a train that flowed several feet behind her. 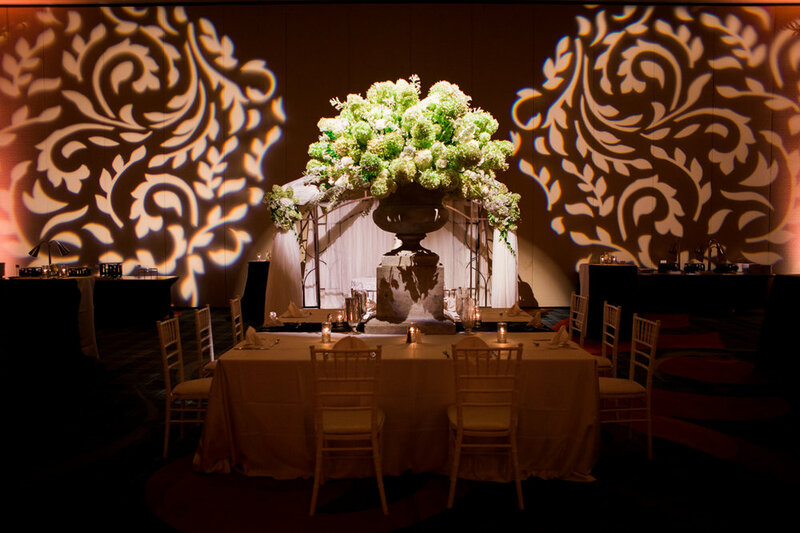 Pristine white walls, a golden chandelier, and the aforementioned floral arrangements made up the ceremony room. Guests were awestruck by the beauty of the newlyweds as well as the elaborate venue. Their first dance was reminiscent of the ballroom scene from Beauty and the Beast, and their eclectically decorated wedding cake towered over the couple as they shared a toast to their future. Purple orchids and red roses anyone? Cheers were given early and often on this wedding day at Windwood. Laughter and beautiful white bouquets from Richardson’s Flowers were displayed about the bridal suite. A stunning bride and handsome groom smiled fondly at one another, eyes crinkled and sparkling with happy tears. Their first look including a grateful message of “Thank You” sported across rustic, wooden signs toward those who came to celebrate their shared love. Soft giggles and open-mouthed faces were given to guests as Anna made her way down the aisle toward her excited groom. Jim ‘N Nick’s fueled the newlyweds and their audience as they made grand movements of dips and twirls in their first dance. Champagne was shared with intertwined arms as they each took a bite of their three-tier wedding cake from Dreamcakes, and the night ended with jovial singing and grooving up onstage. Cheers to the soon-to-be Mrs. Tow! First looks for loved ones: friends, family, and groom. Reception necessities: a dramatic dip, champagne toasts, songs to scream every word to, and fun-filled exit. “I do” kisses, cheek kisses, fur-baby kisses, kisses from loved ones, Windwood Equestrian has seen it all. To celebrate this year’s Valentine’s Day I compiled only SOME of my favorite 2018 wedding kisses the Arden Photography team captured. I emphasize some because there are far too many to choose from, although these picks are quite up at the top. Maybe these sweet moments will give you future ideas on how you want to serenade your love. Summer was finally coming to a close, and Arden Photography was not at our usual venue for this particular wedding. This darling bride’s day begun at Bluff Park United Methodist Church. A beautiful venue that featured a large cross-shaped stained-glass window at its apse above its glistening white elevated altar. Light-hearted conversations were held while the bridal party sipped on their coffee, and embraces of excitement were shared between mother and daughter. Lindy glowed in the late-summer sun, smiles of “today’s finally the day” passed around to everyone she looked at. The bride and groom all but skipped out of the church, hands intertwined, arms raised in celebration at the finale of their ceremony. I captured the beaming newlyweds under a sunset of brilliant pink, orange, and lilac hues; a promise of a new-day’s beginning as a married couple on the horizon. Sparklers lit their path to their foreseen honeymoon as congratulations and well-wishes were enthusiastically called out to the couple. Starbucks sips, soft smiles, and dainty details. Who doesn’t love ring-bearer hugs? Sunsets and sparklers? I think yes. It’s late-July for this wedding celebration, and there is an overflow of laughter coming from our bridal suite. A now practical wedding signature of silk robes were worn by this lovely bridal party as they all gathered around the soon-to-be Mrs. Biggs and showered the bride with compliments and caring embraces. Hallie’s bouquet of peach, coral, and white roses complemented the simplicity of her lace trumpet-style gown as well as the season she intended to be wed. Words of encouragement and love poured from her father’s lips as he prepared to hand over his daughter at the altar. You could truly see the love he has for Hallie as he walked her down the aisle beaming with confidence and rosy cheeks. Feel the Beat Entertainment carried the sweet couple to the dance floor for their first dance as husband and wife, and the guests soon followed suit. 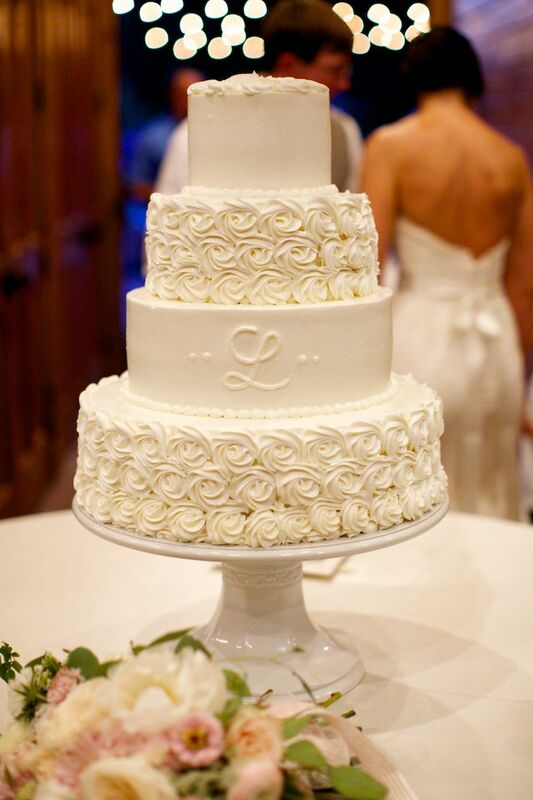 Their wedding cake from Magnificent Cakes donned the same color scheme of roses to match the bride’s bouquet and quickly vanished as people lined up to get a taste. Light sticks with congratulatory statements were waved in the air as Mr. and Mrs. Biggs drove away from Windwood for continued celebration. Devoted kisses, quick dips, and mischievous grins. Kissing the fiancé life goodbye, and saying hello to the Mr. and Mrs.! Halfway through 2018, and Windwood is met with one of the most fun-natured couples to be wed here. Lauren, the bride, is constantly radiating with smiles and positivity, and her groom, Hall, continuously throws open-mouthed, wide-eyed faces at the camera. Before donning her gown from Ivory & White, I am able to capture a few fond moments of Lauren with some of Windwood’s permanent residents. 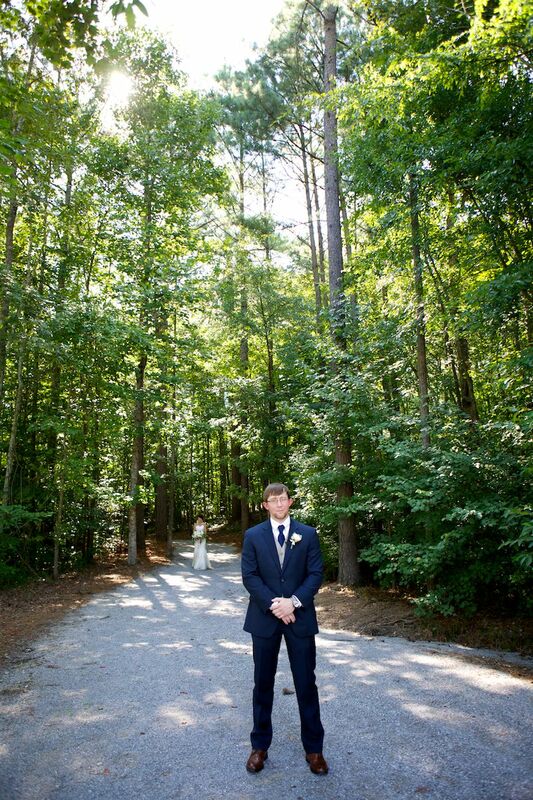 After their first look and a lot of goofiness, the couple was ready to be separated, but only for a short moment. Smiles were passed along every guest as they witnessed these two fun-loving characters come together as one. The husband with his, now, wife gently held his Lauren’s face in his palms as he beamed at her, eyes so scrunched one would think they had disappeared. Contented looks were thrown at one another as the day finally settled to its final moments of sharing their wedding cake with one another, from Magic Muffins, and grooving their way out to their honeymoon destination with tunes from Emerald Empire Band playing in the background. One of our very own horses making its wedding debut. Lots of sweet friends and one loving groom. Happiness truly radiates to others. Special memories shared as one. I remember this day at Windwood Equestrian like it was yesterday. Summer was at full force, a blazing sun had no ounce of shame as it glinted off of every reflective surface its rays could reach. Despite the heat, the giggles, excited nerves, and wandering eyes of this precious couple made it all the while. 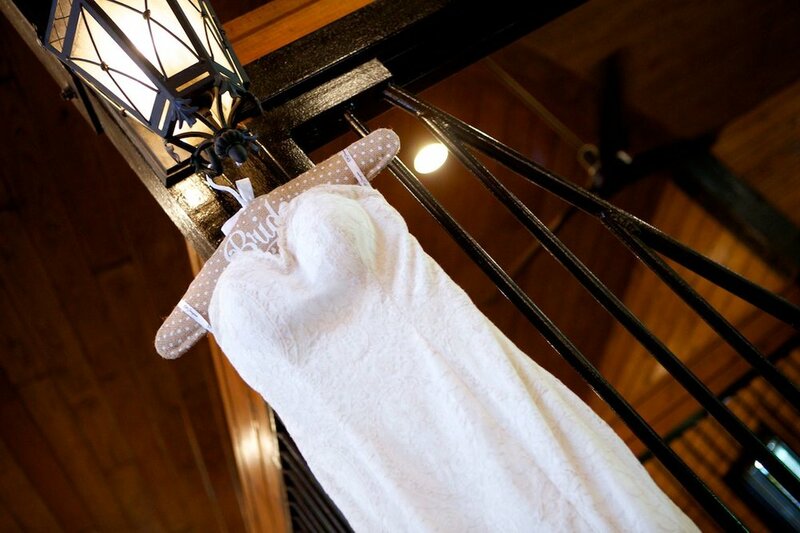 Meredith donned a timeless gown from Carriage House that drove her groom to tears when he was finally able to take a peek at his bride during their first look. 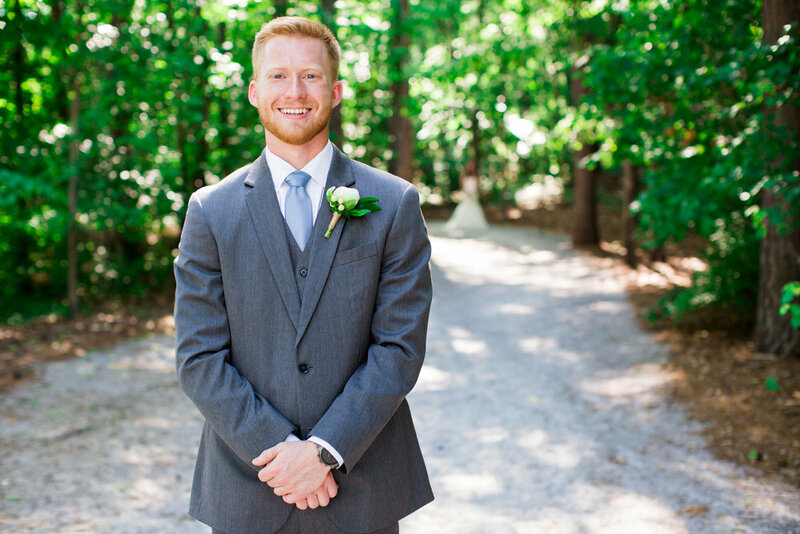 The tears were quickly replaced with loving glances and an embrace filled with compliments to his soon-to-be Mrs. A blonde-haired, blue-eyed angel ran about the bridal party and caused an eruption of laughs with her flirty sideways glances and teetering skip. Kisses were stolen quickly and often post-ceremony, almost as if to check to make sure the whole experience was real. Beautiful floral arrangements from Laurel Greene Studio were meticulously placed about the reception area, while Happy Catering and Kathy G took care of another sense. The sound of Motown drifted through the dancing couples from Accent; and before the newlyweds could make their escape in a shower of rose petals, they shared their first wedding cake bite together under a chandelier of white roses and baby’s breath. A first look at a beautiful future. A morning, a day, a night to remember. 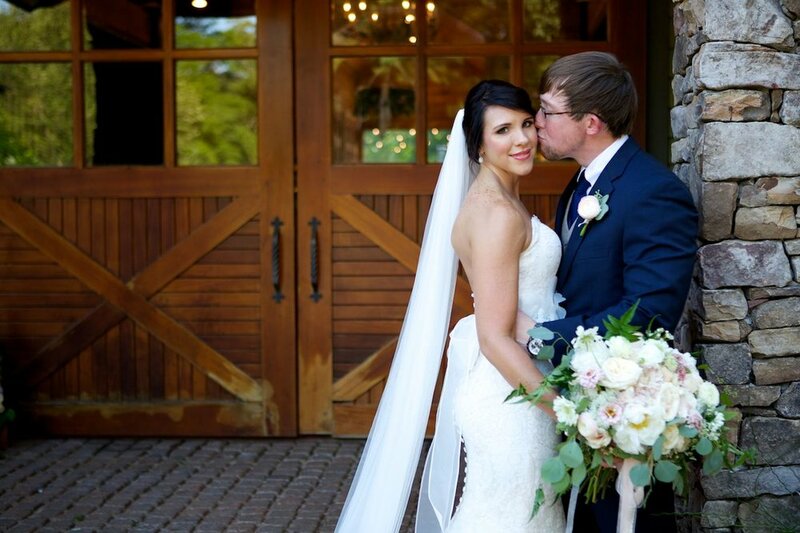 This sweet summer wedding in late May brought (actual) sunshine to us at Windwood Equestrian. Sunflowers filled the bride’s bouquet as it emulated the sun shining on our faces throughout this wedding day. They also showcased their rays at the altar and even on their wedding cake. It’s not a lie when they say the color yellow brings joy! 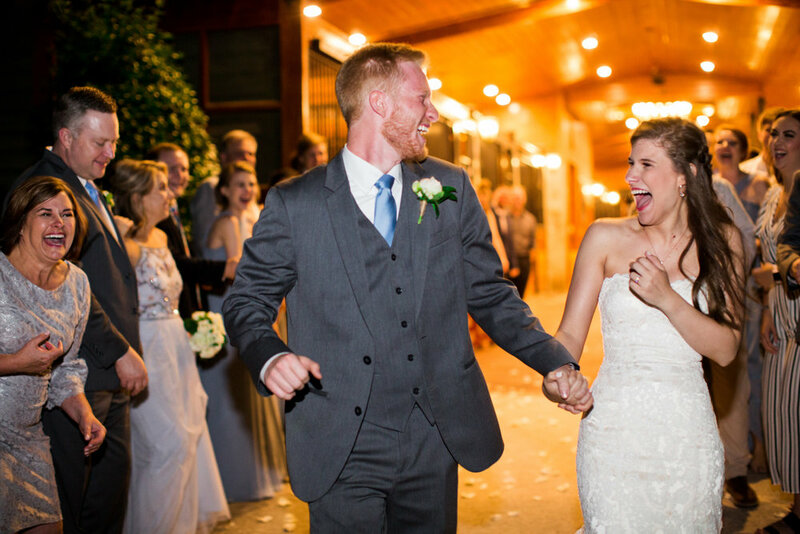 You could see the loyalty and trust in these newlywed’s eyes, characterized by military relationships, throughout their first look, when the bride made her way to her groom, and as they left in a frenzy of glow sticks that kept their honeymoon path aglow. Arden Photography extends well wishes of luck and love to Abigail & Mathew! Man’s best friend photo-ops are always the best! Sunflowers added a pop of color to this summer wedding! Lots of smiles for the newlyweds. Summer was quickly approaching at Windwood Equestrian as the days reigned longer and the nights became warmer. Arden Photography celebrated the marriage of Larkin and Garrett in mid-May, their love burning just as the sun on our backs as we stood outside to take formal pictures. Everyone watched in awe as the, quite literally, glowing bride made her way down the aisle, sun at her back and arm-in-arm with her beaming father. As do all ceremonies, it went by fast in a flurry of loving glances and personal vows to one another, sealed with a kiss and a promise of forever. Happy Catering kept the love flowing with full tummies, and Olexa’s featured a wedding cake drizzled with dripping chocolate sauce and surrounded by chocolate-covered strawberries. Goodbyes were compassionately said as the newlyweds boarded their convertible to continue their night together. Accent colors can tie a look all together. Before, during, and after the ceremony. What’s your favorite ceremony moment? Creating memories to last for a lifetime. The beginning of May at Windwood Equestrian was met with this lovely bride and her beautiful entourage. Lindsay’s dress from Bella’s Bridal was so tasteful and classic, featuring a lace design with a sweetheart neckline on a trumpet style gown. Her bouquet following suit: timeless and simple. Periwinkle accents peaked through her otherwise white floral décor, and this accent made its way into the bridesmaid’s attire as they slowly made their way to the sides of the altar. This sweet couple was married under a canopy of trees at the peak of their greenery. At the reception, Taco Mama was served, although the way it was presented made it appear as if we were being served fine dining. The night flowed effortlessly, especially with the help of Feel the Beat Entertainment, and before I knew it, the couple was met with rose petals being tossed above their heads as they made their way to their get-away vehicle. Smiling faces and sweet notes. First look requirements: a loving couple, supportive friends, and, of course, a beautiful bouquet. Smiles and giggles were floating everywhere on this beautiful day at Windwood Equestrian -- perfect for family members and loved ones to celebrate the love this charming couple share. Emotions of love, gratefulness, and excitement were ever present, especially in these darling moments I was able to capture. The sweetest blue-eyed flower girl prepared the aisle for the bride to make her grand entrance. You could physically feel the butterflies intensify as the bridal march chords began playing. A gentle kiss was shared at the climax of the ceremony, and a shy, but meaningful first dance at the reception followed as their audience gazed on. The couple sealed their wedding celebration with a quick peck in the back of their get-away vehicle on the way to their honeymoon location. Congratulations from Arden Photography; we are so grateful we were able to be a part of such a fond memory! Loving and emotional moments shared with family. Smiles everywhere, especially from this sweet little one. A beautiful wedding party complimented this beautiful spring day! A season of new beginnings coming to a close. Hannah is one of the kindest brides I’ve had the pleasure of getting to know. 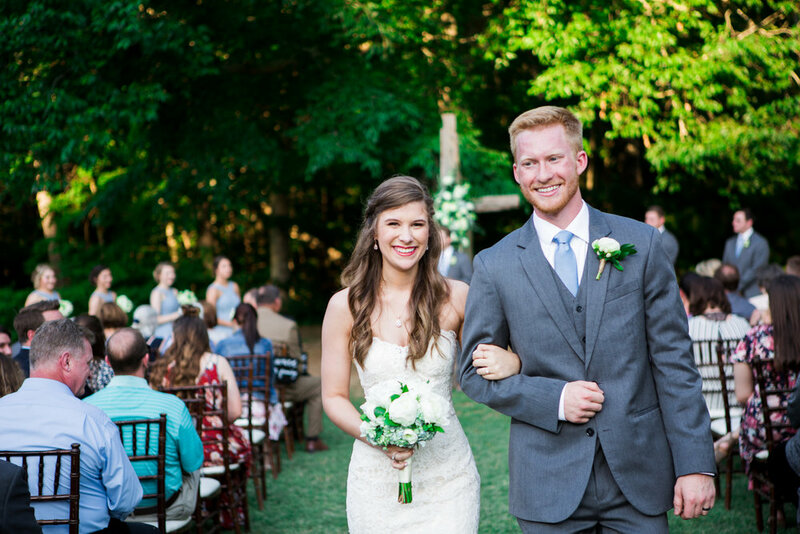 This warm day in April presented itself with crinkled eyes, joy-filled tears, and a rebirth of this sweet couple’s love as characterized by the spring season. After the ceremony, the newlyweds were constantly grinning cheek to cheek at each other, so much so that I feel that was all I was able to capture. No complaints from here, though! Happiness and laughter is always welcome at Windwood Equestrian. Tummies were kept filled to the brim with yummy foods from Happy Catering and a beautiful white wedding cake with delicate rose detailing from Barb’s Cakes. The lovely couple were sent off with well wishes and a light show of multi-colored glowsticks waving them off to their next destination. First looks manifest an array of emotions. A love we wish will forever bloom. Simultaneous firsts and lasts in every one of these special moments. 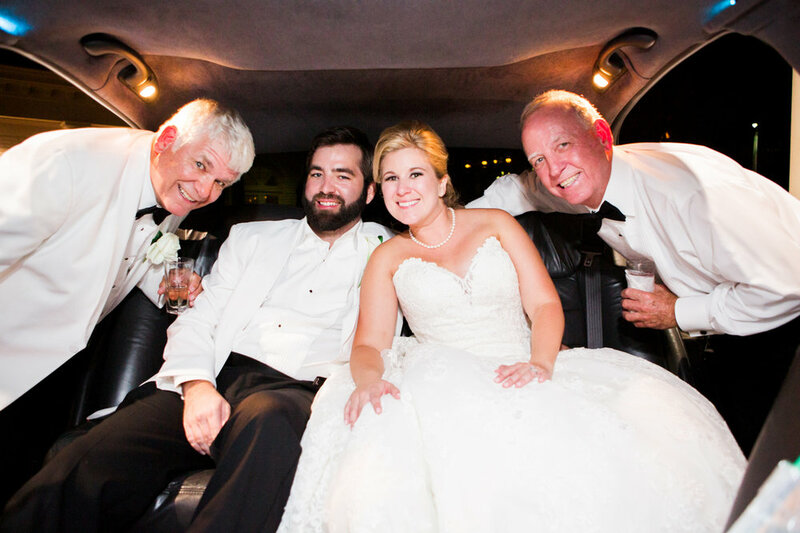 The beginning of April was met with this sweet bride that brought free-spirited laughter and eye-smiles to everyone at Windwood Equestrian in her wake. Jamie exuded timeless class and enthusiasm throughout her wedding day, as expected of a former Miss Alabama. The flowers from Bloom & Petal chosen for this special day exemplified her kind and bright demeanor that brought smiles to even the most stubborn of faces as she made her way down the aisle. People are wise when they say true beauty is created from the inside out and thus radiates to others. 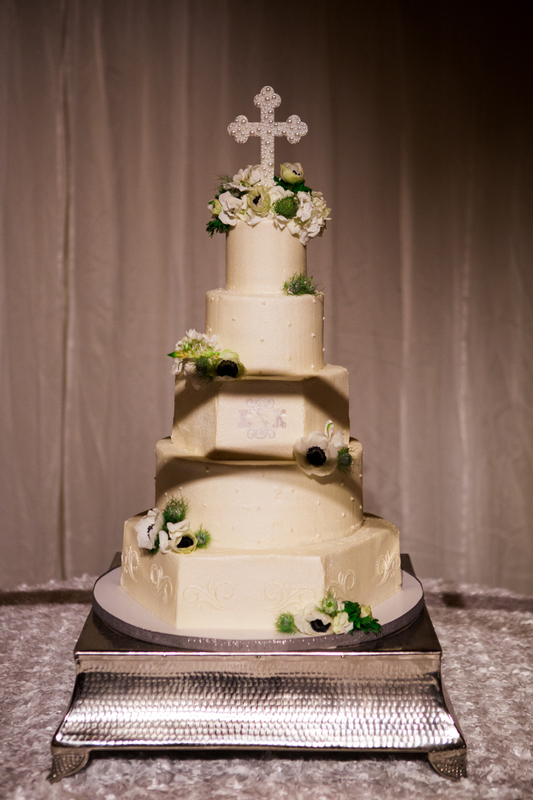 Loving kisses were shared from the final moments of their ceremony, in front of their wedding cake with a non-traditional drip design from Joe’s Italian, and up until the newlyweds departed. Arden Photography extends a huge congratulations to Jamie and Alex for not only allowing us to share these precious moments with them, but also bringing joy to our hearts throughout the day. The end of March was approaching for Windwood Weddings, but this precious couple was beginning their lifelong journey of love and happiness. Bouquets filled with white and light pink roses complimented the bridesmaid’s dresses and the blushing cheeks of the soon-to-be Mrs. Harris. Nervous giggles and wandering eyes were continuously present during their first look. I’ll let you in on a little known fact of Windwood: our Lady Bank roses that bloom during the last week in March to the middle of April make for the perfect backdrop for wedding photos i.e. the arbor the wedding party is standing in front of for pre-ceremony pictures, especially to capture the springtime feel on your special day. When the, what felt like, long-awaited ceremony occurred, a collective sigh of contentment was ebbing from the newlyweds. This contentment grew to pure joy as the couple serenaded the crowd with their first dance and shared tastes of their wedding cake. The night ended as if your favorite sports team just won with shaking poms lined across the walkway as the Harris’s were off to their honeymoon destination. We’re blushing at this sweet couple (and these precious bridesmaid dresses). Waving hello to the soon-to-be married couple! Grinning for a new beginning. Dancing the night away into a pom-filled exit. Jeannie and Ryan were wed on a lovely day in March. The Spring sun warmed our backs as the love we witnessed between them warmed our hearts. Each wedding we photograph has an element of tradition and elements that make them personalized to the couple. We loved the Alabama Cake from “Cakes by Jan” even though this wasn’t our favorite Tuscaloosa team’s year at National Championship we all love a diehard fan. Nothing says fan like eating Alabama Cake. All the guest’s belly’s were as full as there heart’s because Happy Catering knows how to feed a crowd. As guests enjoyed the evening and danced into the night with music by Feel the Beat Entertainment, our sweet friend Danny Brewer, we all enjoyed ourselves and this first Spring 2018 wedding for Windwood Weddings and Arden Photography. A beautiful start to Jeannie and Ryan’s wedding day. Lots of love for all during the traditional vows and who doesn’t love a precious flower girl photo? Roll Tide and let’s eat cake! The image of a happy pair of newlyweds waving to friends and family as they escape in a car sporting sentiments written in shaving cream and trailing tin cans down the street is understandably, a classic one. Today, options abound for couples looking to cap off their unforgettable evening in an equally unforgettable way. Lavender, when substituted for rice or birdseed, makes for an aromatic and naturally colorful confetti. If lighting up the night is more your style, consider sparklers or glow sticks. Classic cars also serve as great conversation starters and fit any black tie affair to a tee. In short, a grandiose exit may not be necessary in actualizing every wedding, but the end of a wedding always means the beginning of a new life for two people dearly beloved by all of their attendees. Happy One Year of marriage to Kyndle and Kirby! 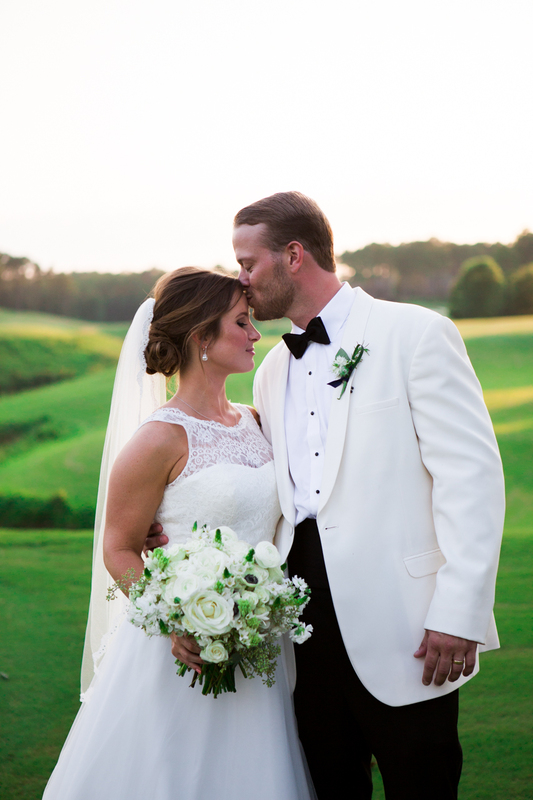 Lindsay and Blake had the most gorgeous summer color palette! A quick sneak peak of Larkin and Garrett's special day! These two were picture perfect for their magical day, and we can't wait to share more!